'Baby Blue Eyes' are delicate little plants with bright and vivid light blue flowers. Very easy to grow they are an ideal addition to rockeries, hanging baskets or other containers where their hardiness and dry-tolerance ensures a good display. The Victorians loved this tiny flower because of its dainty two-tone colour and airy, light green foliage. 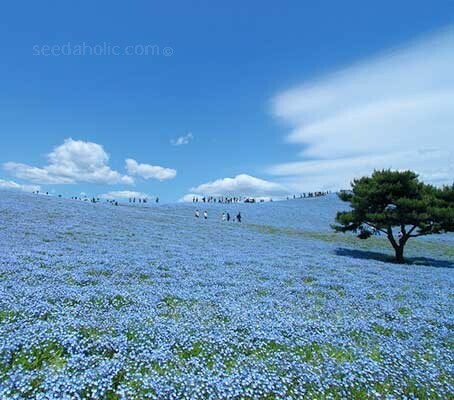 Many photographs make the small flowers, which are only 2 to 3 cm wide (1in), appear much larger than they really are. 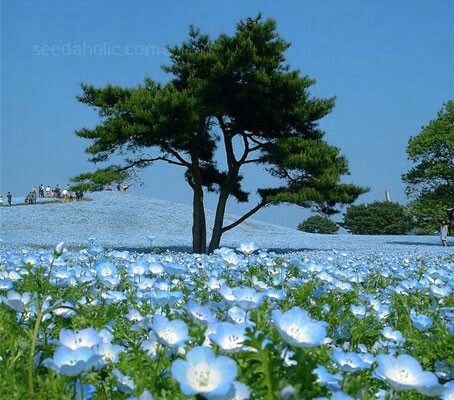 They are used extensively to amazing effect at the Hitachi seaside park in Japan, the plants are also perfect for shaded areas: “nemophila" means "shade-lover"
Seeds are best sown in short drills 12mm (½in) deep once temperatures reach around 20°C (68°F). They prefer a sunny open site but will grow in most sites and soils. Sow outdoors where they are to flower. Prepare the ground well and rake to a fine tilth before sowing. Mark the sowing areas with a ring of light coloured sand and label if sowing more than one annual in the same bed. Sow 1.5mm (1/18th in) deep in rows 15cm (6in) apart. Seeds germinate in 7 to 21 days. The seedlings will appear in rows approx 6 to 8 weeks after planting and can be told from nearby weed seedlings quite easily. Thin the seedlings out so they are finally 23cm (9in) apart by early summer. Compost should be kept slightly moist, but not wet at all times. Sow in pots or trays of moist seed compost and cover with a very fine sprinkling of compost or vermiculite. After sowing, do not exclude light as this helps germination. Keep the surface of the compost moist but not waterlogged; germination will usually take 14 to 21 days at temperatures around 20°C (68°F). Prefers well drained soil enriched with manure or compost ahead of planting and can be grown on light sandy soils. Feeding is rarely needed but water well, apply complete plant food as growth begins in the spring. Cottage/Informal Garden, Flowers Borders and Beds, Rockeries, Pots, Baskets and containers, Underplanting. 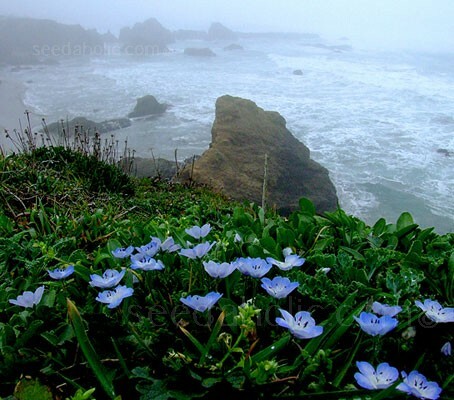 Nemophila species are mainly native to the western United States, though some species are also found in western Canada and Mexico, and in the southeastern United States. It is a member of Hydrophyllaceae - The Waterleaf Family. This is a small family of about 250 species, distributed around the world but perhaps mainly coming from the Americas. Members of this Family usually have blue or purple flowers, hairy leaves without stipules and seed capsule containing many seeds. 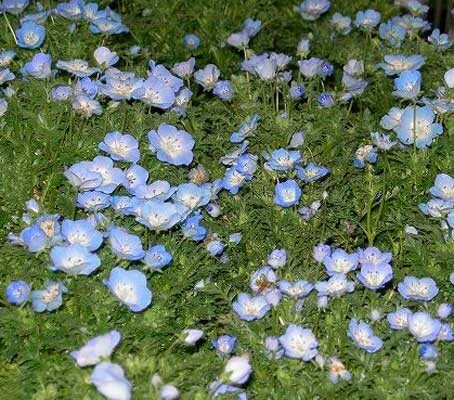 Nemophila means “woodland-loving.” It comes from the Greek nemos, which means ‘glade’ and the Greek word phileo, which means ‘to love’ meaning that it has 'an affinity for groves'. The species is named after Archibald Menzies (1754-1842), Scottish botanist and surgeon. Born at Styx, an old branch house of the Menzies of Culdares near Perthshire in Scotland. Menzies studied both botany and medicine in Edinburgh, and was delighted to be appointed surgeon to an expedition around Cape Horn to the North Pacific with the ship Prince of Wales, a voyage which took nearly three years. He sent back plants and brought home a ship's company in good health.